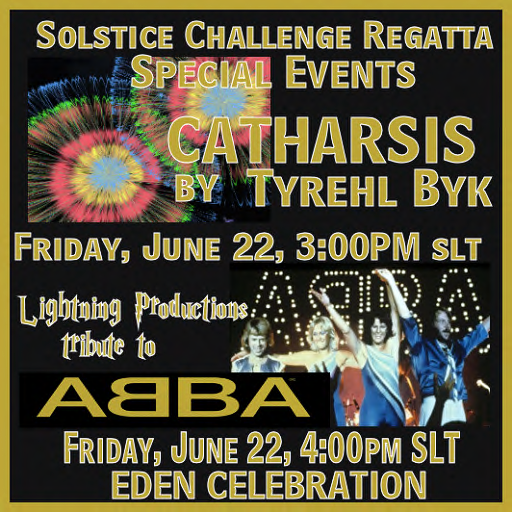 The Solstice Challenge S4L fundraiser kicks off on Friday, June 22 with a wonderful party hosted by Elbag Gable in Eden Celebration. It begins with a Big Bang, courtesy of a massive fireworks show that should get the race skippers excited for the upcoming competition! That will then blend in to a performance by SL’s Lightning ABBA tribute. 🙂 This should be something great; please come and celebrate Sail4Life’s Solstice Regatta! ← Museo Volvo Ocean Race, Alicante.